Shinigami to Shoujo (Girl and the Grim Reaper) is a somewhat surreal urban fantasy otome visual novel. It follows Tohno Sayo and her strange relationship with an amnesiac man who calls himself a grim reaper. Each chapter starts with a short poetic fairy tale which allegorically parallels the oncoming happenings in the actual plot, giving the whole overarching story, supposedly set in the real world, a very dream-like fantastical feeling. The most important among them is, of course, a tale about a girl and the grim reaper searching for the most beautiful word in the world together. The first three chapters might be a bit of a pain to get through, especially for male readers who will likely not enjoy the overwritten banter of archetypal otome game characters and the uneventful, slow plot at the beginning. Things get a lot better once the real story finally kicks in the fourth chapter, where the routes finally start to diverge. 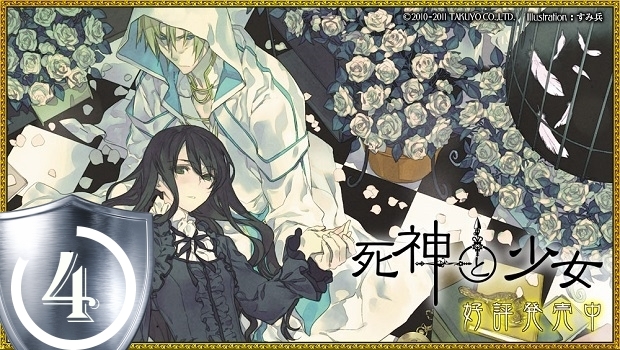 Though I wasn’t particularly fond of the main male characters, save for the grim reaper himself, due to their somewhat exaggerated Romeo-like infatuation with the heroine, their individual stories turned out to be surprisingly good and even thought-provoking. I fear any concrete details would become instant spoilers as individual routes turn into a complete twist fest almost instantly, but I was particularly entertained by the final route of the grim reaper where both him and the heroine are forced to go through a relatively complex reconsideration of their motivations. The feeling of fantasy and reality clashing pervades the work, and even at the very end I couldn’t tell if I should treat Shinigami to Shoujo as a beautiful fairy tale or a depiction of tragic reality of a delusional mind. To counter lyrical prose and friendly ghosts, there are talks about money and psychiatrists. To counter beautiful flying fish and talking plushy animals there are suicide attempts and forced marriage. To counter beautiful mystique of a man who calls himself a grim reaper there is this looming notion that he might turn out to be a serial killer. One could even interpret this seemingly dark, yet elegant and beautiful fantasy story as an allegory to a person’s flawed perception of reality. As a girl’s journey through her fantasies culminating in an ultimate choice between facing reality or sinking in delusion, a bit akin to Alice in the Wonderland.